More evidence that the neuropsychiatric dysfunction of depression is a brain illness like Parkinson's, tinnitus and pain disorders. A new study published, March 16, 2018, in Nature Communications by Vanneste, Song, and De Rigger, details the findings of thalamocortical dysrhythmias today. 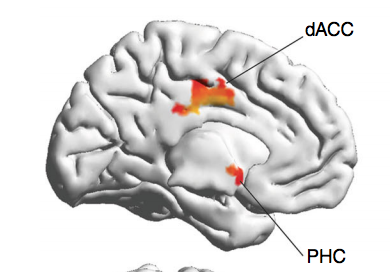 That big fancy word, thalamocortical dysrhythmia, basically means that compared to controls (patients without the disorders), the patients with these disorders had different firing of the neuronal connections between the thalamus (thalamo) and other brain areas (cortical). These researchers are developing (and patented) a computer analysis of measuring the EEG patterns of particular areas of the brain and have noted findings in each of these disorders that could be used as a biomarker or means to direct particular treatments. Of particular interest to Dr. Cochran is that the depression findings point to a dysrhythmia of the the dorsal anterior cingulate cortex (dACC) and the parahippocampal cortex (PHC) which have been shown in other studies to be affected by rTMS treatments. Dr Andrew Leuchter, of UCLA, published a theory for the effectiveness of TMS in 2013 in Frontiers in Human Neuroscience which proposed that TMS entrains and resets the neuronal firing between these dysfunctional regions and retrains the brain to its default rhythm (prior to depression). In accordance with these theories, Dr. Cochran and Lauren Valencia LCSW have completed a workbook that they use with each patient who receives TMS at the NeuroScience and TMS Treatment Center and titled the workbook: Train your Brain: Your Record of Care with Transcranial Magnetic Stimulation. We see that the effectiveness of TMS is augmented with the other therapies we offer during TMS treatments (goal-oriented psychotherapy and medications), and we believe this is why we get better results.